This 117 net saleable acre park has phase 1 ready for immediate sale. Competitive land and development costs. Access to Highway 20 and future access to Highway 11A. Within close proximity to the QE 2 corridor. Commercial, Light Industrial and Heavy Industrial lots. 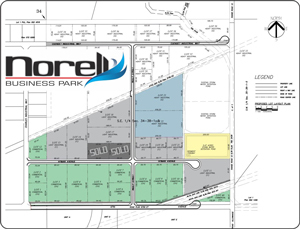 All available lots in the Norell Business Park are rough graded and serviced with paved roads and overhead street lighting. Industry and business investment will find an ideal place to grow in Sylvan Lake. The Town of Sylvan Lake is a thriving and expanding community that has seen impressive residential and commercial growth over the past decade.